Collectively, the results presented improve upon the utility of an important genetic resource and attest to a complex genetic basis for differences in both leaf metabolism and fruit morphology between natural populations. Diversity of accessions within the same species provides an alternative method to identify physiological and metabolic traits that have large effects on growth regulation, biomass and fruit production. Here, we investigated physiological and metabolic traits as well as parameters related to plant growth and fruit production of 49 phenotypically diverse pepper accessions of Capsicum chinense grown ex situ under controlled conditions. Although single-trait analysis identified up to seven distinct groups of accessions, working with the whole data set by multivariate analyses allowed the separation of the 49 accessions in three clusters. Using all 23 measured parameters and data from the geographic origin for these accessions, positive correlations between the combined phenotypes and geographic origin were observed, supporting a robust pattern of isolation-by-distance. In addition, we found that fruit set was positively correlated with photosynthesis-related parameters, which, however, do not explain alone the differences in accession susceptibility to fruit abortion. 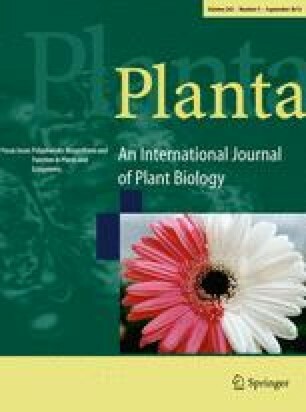 Our results demonstrated that, although the accessions belong to the same species, they exhibit considerable natural intraspecific variation with respect to physiological and metabolic parameters, presenting diverse adaptation mechanisms and being a highly interesting source of information for plant breeders. This study also represents the first study combining photosynthetic, primary metabolism and growth parameters for Capsicum to date. The online version of this article (doi: 10.1007/s00425-015-2332-2) contains supplementary material, which is available to authorized users. This work was supported by Conselho Nacional de Desenvolvimento Científico e Tecnológico (CNPq) [grant number 306355/2012-4 and 484675/2013-3 to ANN and 472787/2011-0 to WLA], Fundação de Amparo à Pesquisa do Estado de Minas Gerais (FAPEMIG) [grant numbers APQ-01713-13 and APQ-02548-13] and Max Planck Society to ANN and WLA. Research fellowships granted by CNPq to ANN and WLA are also gratefully acknowledged. The authors also acknowledge the NUBIOMOL-UFV for providing the facilities for the analysis of this work. Thanks are also due to Jéssica Maciel Terra and Franklin Magnum de Oliveira Silva (UFV) for help in the experiments and statistical analysis.